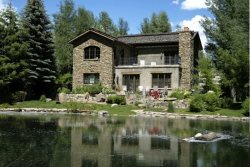 Located 5 minutes from Bald Mountain's River Run Ski Lifts, the Big Wood River, Downtown Ketchum, and the Bike Path- this 4 BR Luxury Weyyakin home includes access to the Weyyakin Clubhouse, Pool, Hot Tub, Tennis Courts and Fishing Pond. Warm and Inviting, the open floor plan is naturally lit with an abundance of Windows and Wood Floors throughout the Kitchen/Living/Dining Area. GOURMET KITCHEN: The gourmet kitchen is complete with a Flat Screen TV, (2) Ovens, a Gas Cooktop, Counter Seating for 2, and all the tools and utensils necessary for a home cooked meal. BREAKFAST NOOK: The breakfast nook, adjacent to the kitchen, seats 4- a great spot for a quick snack or informal meal. DINING AREA: The dining area, with access to the Deck and Gas Grill, comfortably seats 8 with stunning views. LIVING AREA: The living area with Wood Burning Fireplace, Flat Screen TV with DVD Player, (2) Couches, (2) Overstuffed Chairs, Game Table, and access to the Deck is the spot to relax with friends and family. FURNISHED BALCONY: Dine alfresco, watch the kids play on the lawn or catch the last rays of sun on the furnished wrap-around balcony with Gas Grill. Additional modern conveniences include Free WiFi, 2-Car Attached Garage, and W/D. Less than a mile to River Run and downtown Ketchum, Weyakkin vacation homes include privileges to Weyakkin's Pool, Hot Tub, and Tennis Courts.